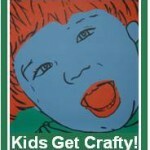 This post was meant to go live NEXT week (oops)… Please find the Kids Get Crafty linky on the Solar System Post! 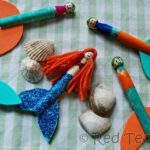 Welcome back to kids crafts and our clothespins pirates! 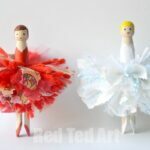 We have been meaning to make peg dolls for a long long time.. there really are so many crafts out there, that we simply don’t get around to… but finally we did make some peg people! 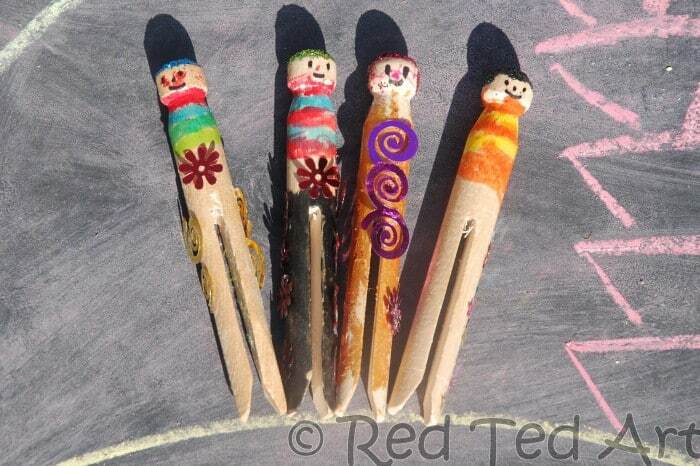 I was working on some peg dolls for my craft book coming out next year… when Red Ted got inspired… there was no stopping him and he made 3 sparkly clothes pin pirates in one go! 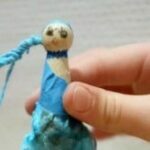 Pip Squeak also joined in and made a beautiful golden peg mummy in no time. The sparkle bit came in a moment of inspiration Zing Zing Tree sent me some of her beautiful glitter (this glitter is beyond gorgeous – super fine and just lovely.. makes me want to craft and craft) and sequiny bits (the kids couldn’t get enough of these) and pieces to enjoy and the kids just went crafty mad. They had such a lovely time. Thank you, to Zing Zing Tree for sending us such gorgeous confetti and even more delicious glitter. 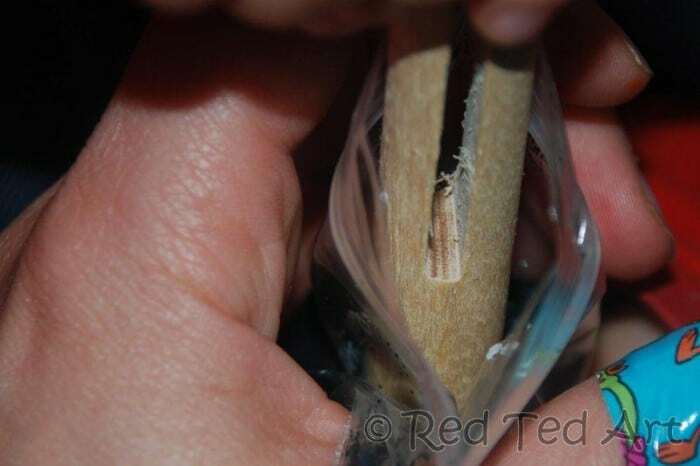 We all took one look at it and HAD to get crafty straight away! 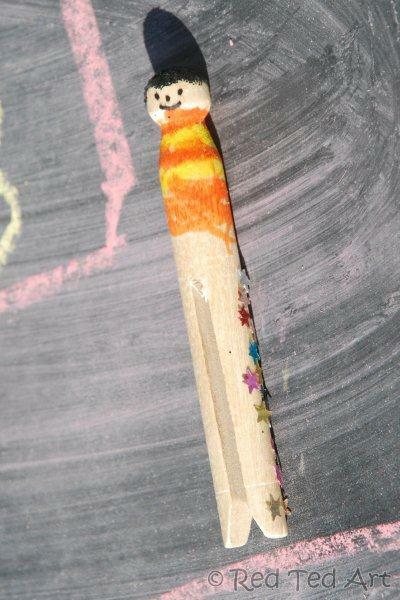 I think it made our clothe spin people even more special! 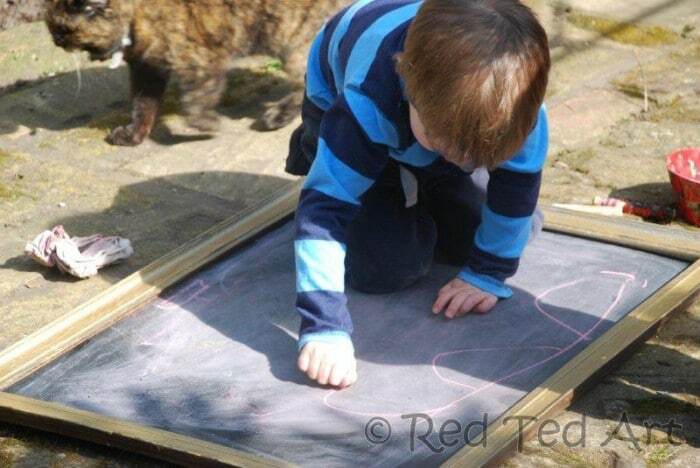 I love how Red Ted is managing to do more and more by himself. I help with the eyes and mouth (he insisted) and applied the glue for the children (they told me where to put it). They did the rest. 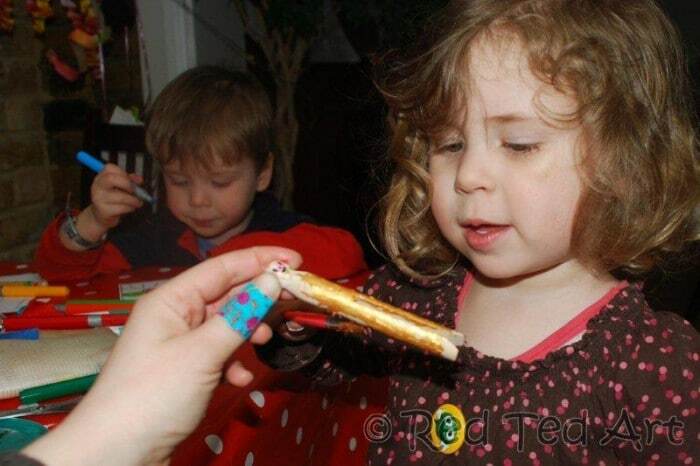 2) We then covered the heads in a dollop of glue and dipped them in the glitter. Finally adding sequence to the body. How about a pirate ship and a kidnapped maiden? 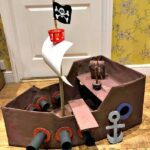 Who then land on a treasure island…. 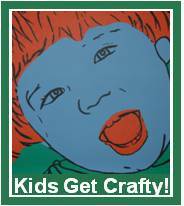 This post was meant to go live NEXT week… Please find the Kids Get Crafty linky on the Solar System Post! 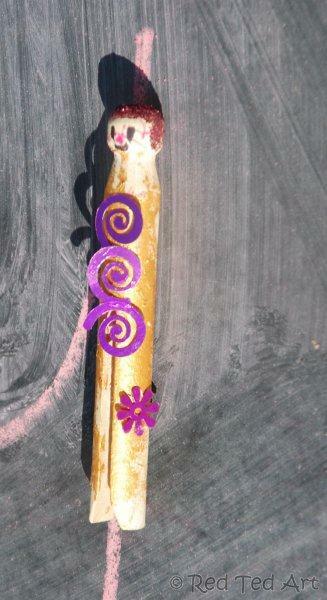 Do hop over an share all your kids crafts and especially your clothe spin crafts there!! Disclaimer – Zing Zing Tree sent me some glitter and sequency bits, but I was under no obligation to write about these or tell you about it. But they are LOVELY. Really, they are. And they made me feel all creative! Your pirates are great…. so simple and fun. 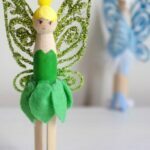 You have just reminded me that I have a stack of these clothes pins in the cupboard waiting to get a bit of personality. Oh no!! These pirates were meant to go live next week! Doh!!! 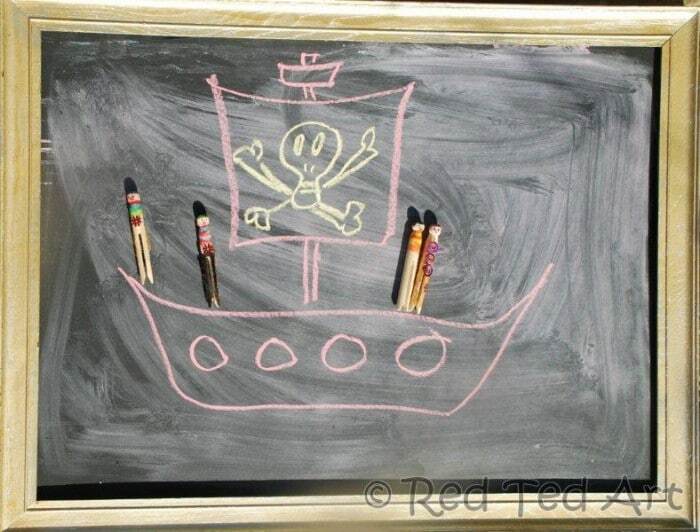 What a fabulous idea to draw a scene with the chalkboard to play imaginatively with the pirates. 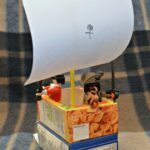 Impressed with the pirate toys! There be some mighty fine pirates on this here page. 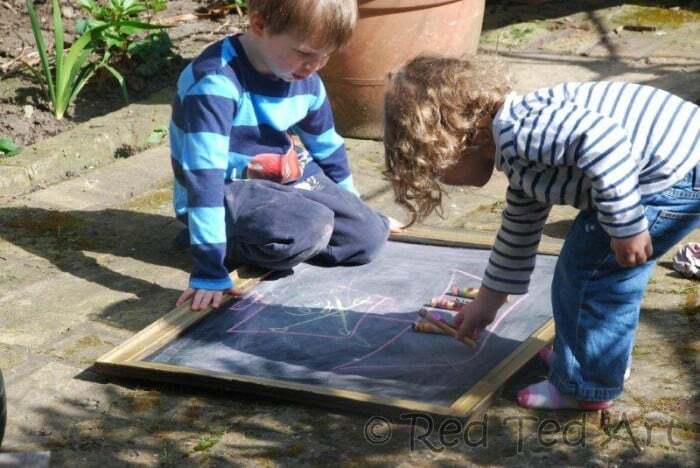 Love the use of the chalkboard! 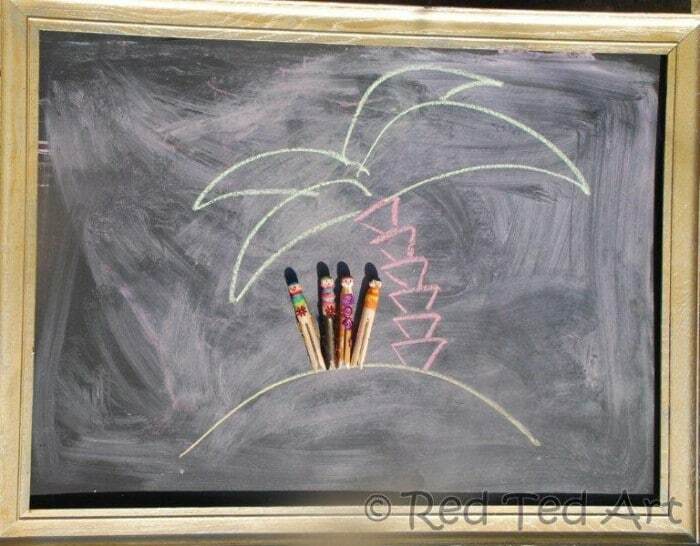 I love Zing Zing Tree! They’re always teasing em about glitter and calling me a glitter phobe on Twitter. I think they may gradually ahve me coming around. It IS very sparkly after all, and very pretty. Alissa – I am a bit of a glitterphobe too to be honest… the glue and method worked v well for us!!!! And Zing Zing Trees glitter is GORGEOUS. The fineness of it is really appealing! 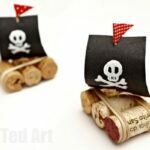 Your pirates look fantastic, and so easy for young children to put together. Thank you!! My 4 yrs old did them all by himself!